Hello LOSTIES! It's getting very real now isn't it? As Jacob may tell us, "We're very close to the end." And this episode seemed very clear in proving that to us. 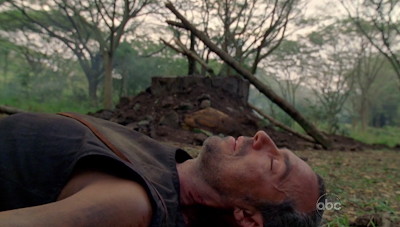 In every penultimate episode to a LOST season finale, we usually witness the ever essential SETUP epic end-game mission of that season. It is no different for this episode leading to the Series Finale of what will go down as TV's greatest achievement (yes, I mean LOST!). For all of the mysteries that have befuddled us all season and some even longer, we are beginning to see everything take shape. The Sideways Stories are coming together in an awesome way, our remaining candidates are getting ever so close to their true purpose and the antagonist of the story has raised the stakes of his ultimate plan as well. I only have 2 more opportunities to do this and I'm not going to waste them folks. Even for a setup episode, it has done its job tremendously and has me super psyched to see how it's all going to end. I'll save my tears for later folks. This episode gets a bonafide WOW!!!!!!! from me. I almost don't want to get into the recap, because once I do, I know I will only be doing this one more time! But alas, the show must go on. Let's do this! 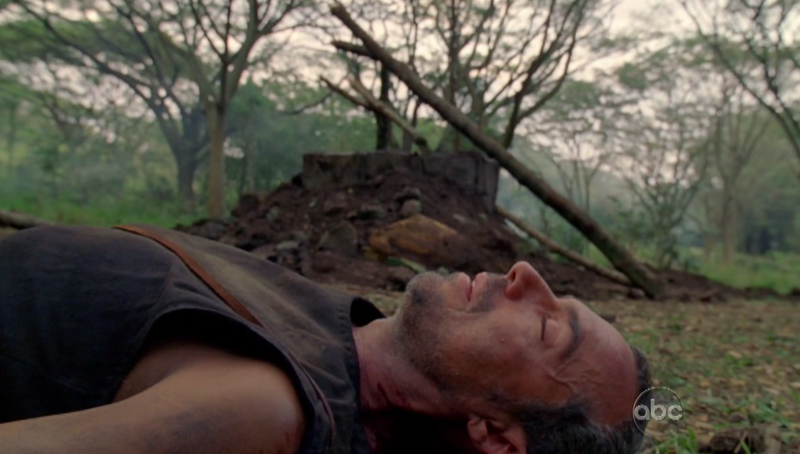 "What They Died For" - One could assume we are going to learn the tale of why Sun, Jin, Sayid, well EVERYONE has died. And by the peak point of this episode, we do get a lot more information from someone who does have answers! But Jacob's chat with the Candidates was only part of the fun of tonight's episode. The Flash Sideways continued to focus on a large collection of the LOSTIES and getting them all moving closer to being in the same place. There may have even been a hint of the ol' Man of Science vs. Man of Faith with a dash of Mr. Eko thrown in there for good measure! Man, I love coming full circle. Anyway, we also rejoin Richard, Miles and Ben to see what they've been up to. And we have a meeting of 2 folks that I sure have been waiting to see for a couple of seasons. And, in my opinion, their relationship concluded the way I always wanted it to! Oh yeah, in case I forgot to mention, Smokey is in this episode too! Time to dive in! 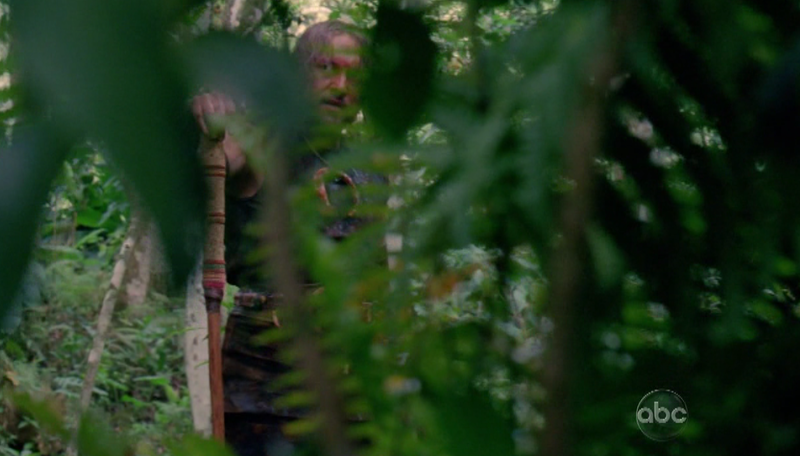 Hello LOSTIES!!!! It's sad to think I will only be saying this in front of a LOST Recap 2 more times after this one. But, at least we should have all GREAT EPISODES to discuss and Instant Classics if you ask me! For me, this one was yet another WOW!!!!! episode in a series of awesomely awesome WOW WORTHY EPISODES! We got several answers and even expanded the Island mythology even though we'll be wrapping up in 3.5 more hours. Sure, nothing was extremely SHOCKING in the episode, but it was still great to see it all and I think it was a necessary back-story to prep us for the end game. I already have been reading some initial reactions and they seem disappointed with what we got and are most concerned with the fact that the Man in Black does not have a name yet. I beg to differ folks! We most certainly have a name, and it is what I may start calling him by the end of this recap until I'm told differently! I can see why the episode may not have been what people were expecting, and with so few hours left in the show it gets even more frustrating when an episode doesn't meet expectations. But that's when I need to tell everyone to CHILL, sit back, relax and enjoy the information we ARE getting. It's all going to be over soon and this information we learned may prove very worthwhile for the 3.5 hour end game of last that is approaching. There will be plenty of time from May 24th until the end of eternity to scrutinize how Damon and Carlton brought their 6 year complicated opus to a conclusion. And it's going to be tough for me to not ask any questions, even knowing that every answer will bring more questions! (Eve taught me that!) But, I don't think these Island Inhabitants of yesteryear know that this is what us LOST Addicts do! So, let's move on and do what we do best! Across the Sea - AWAY from the Island. There is a land out there, yet some characters we have met have never seen it. We took a break from the present day Island story to see the origin stories of both Jacob and the Man in Black (or for a lot of this episode, he was the BOY in Black)! We follow them from birth to their undoing. 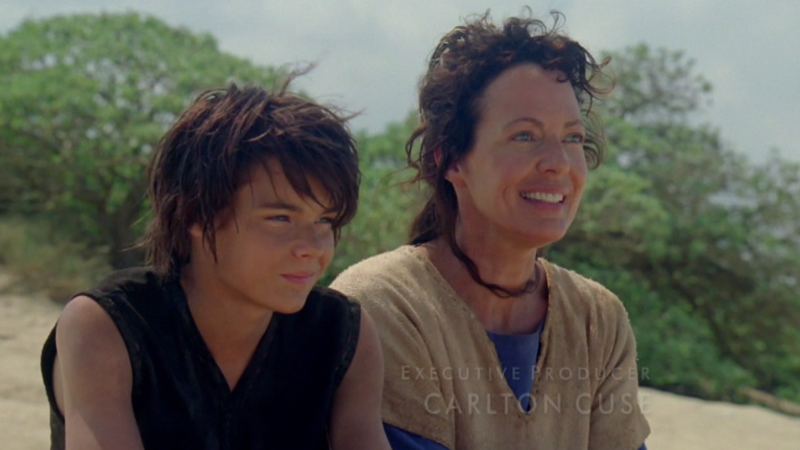 And we met a new character along the way, played by an awesome Allison Janney! I think this episode was a bit therapeutic simply for the fact that it took us away from the dreary and mournful story that we are about to resume next week. We lost some major characters last week and instead of bringing us right back into the fold, we get to continue our private mourning while learning a little bit more about why it may have happened! Time to dive in folks. One storyline to follow, so it shouldn't be too difficult to follow along this week! We open up on a wreck in the middle of the ocean. There is a woman floating by and is still alive. She catches a glimpse of that all too familiar Island! Before long, we see her unconscious on the beach along with wreckage from a ship. She is clearly pregnant! (Was anyone else thinking twins immediately?) She moves inland and finds drinking water. Wow, compared to Jack she found that stuff really quickly! 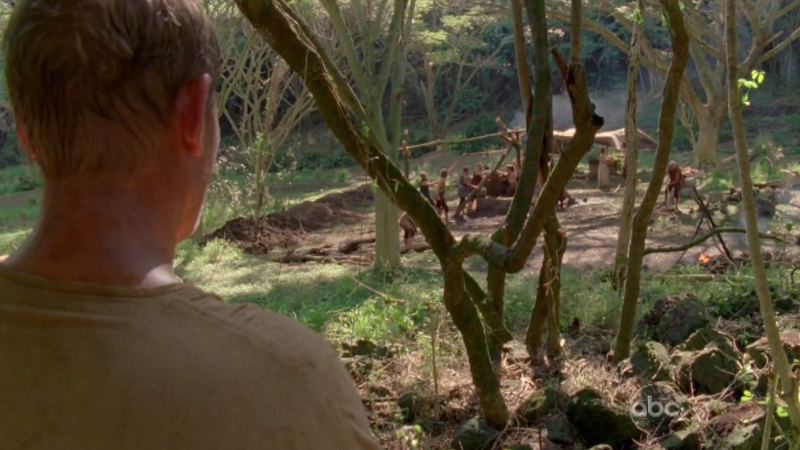 Note: I stated before 1824 because we know Richard arrived in 1867 and we know it's been AT LEAST 43 years that Jacob were on the Island prior to Richard's arrival (we get 2 numbers during the episode. 13 Years after the birth and then 30 years after that). But, if I were a betting man, I would guess that it had to be longer than that! But at least late enough when SHIPS were sailing the ocean blue! I'll make it easier by calling Red Dress woman Claudia since we do eventually learn her name. And isn't it ironic that she was wearing a "RED SHIRT" so to speak? Island Woman speaks in Latin (ahh the language of the enlightened and of THE OTHERS) to Claudia and offers her help. Claudia speaks Latin back (I think). Perhaps a sign of when this episode took place in the timeline? 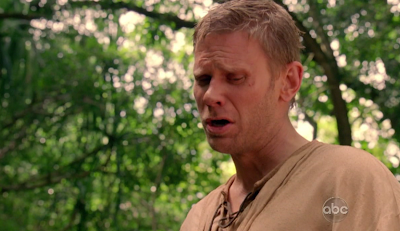 Eventually, they begin speaking English, but maybe we're meant to assume that the entire episode was really spoken in Latin but just for the sake of our ears and the actors/actresses LEARNING 45 minutes worth of Latin dialogue, we got English! Island Woman takes Claudia to THE CAVE! 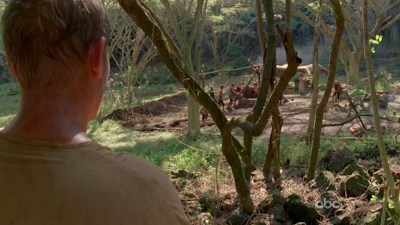 (The same cave that MIB led Jack to in season 1 appearing as Christian Shephard. It just turned out that this cave used to be the home of Jacob, MIB and this Island Lady!) Now, of course, this early in the episode I think we could sense that we were going to get an answer to the question that has plagued us since way back in the beginning of the first season. The question that we have theorized on forever. 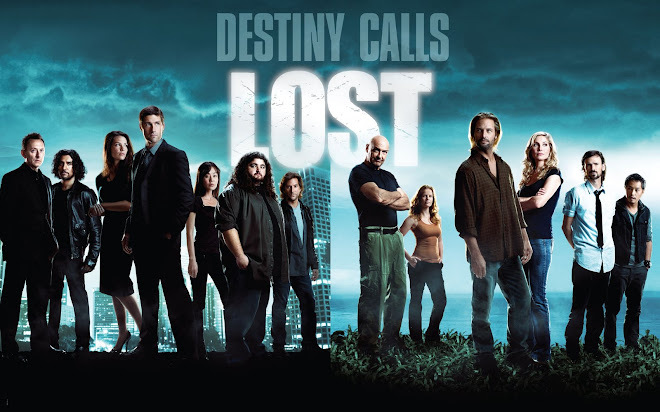 The question that executive producers Damon Lindelof and Carlton Cuse claim that they placed so early in the show so that they could PROVE they knew what they were doing from the beginning. We do get that answer at the end of this episode. Are you sold? I'd say I'm about 50% sold. But I'll tell you one thing. I totally called 50% of the answer weeks ago and no one believed me! But, that's for later in the blog as well. Claudia asks the Woman where the rest of her people are. The Woman says that it's only her. 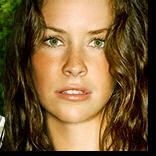 She states that she arrived on this Island the same way that Claudia did, by ACCIDENT. 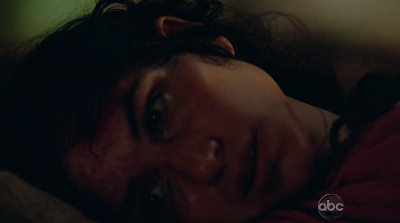 The woman dresses Claudia's wounds. Claudia begins to ask how long she has been there but the Woman interrupts stating "Every question I answer will only lead to another question." 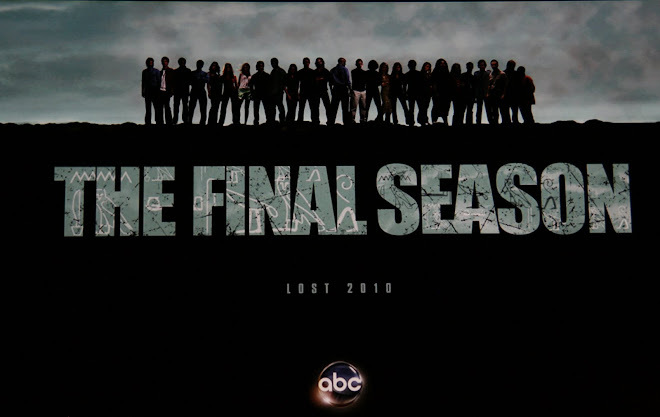 Ahhh, such is the tale of 6 seasons of LOST. And such is the tale of what Damon and Carlton have been telling us. They're providing answers, but it's only going to make us ask what happened before that. So if this woman was the predecessor to Jacob and MIB, then who came before her? How did she get there? How long has she been there? How long was the person before her there? And so on and so forth....all the way until you get back to the Big Bang (creation of the Universe)....and then someone will ask....well what came before the Big Bang? The questioning will never end. This is both the beauty of LOST and the frustration of LOST. But we love it anyway! Claudia wants to find the rest of her crew. This woman says that if there are other people on the Island that SHE will find them. We were told that everything this woman says will need to be analyzed and re-watched, but sometimes I think a line of dialogue can just be a line of dialogue. But it was kind of creepy the way that she said it. And then Claudia goes into labor. The pushing begins and then Island Woman delivers the baby! His name? Claudia immediately names him, JACOB! 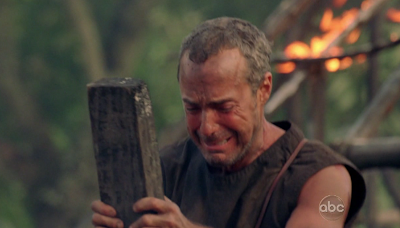 The Michael Giacchino theme for Jacob begins to play. NICE. 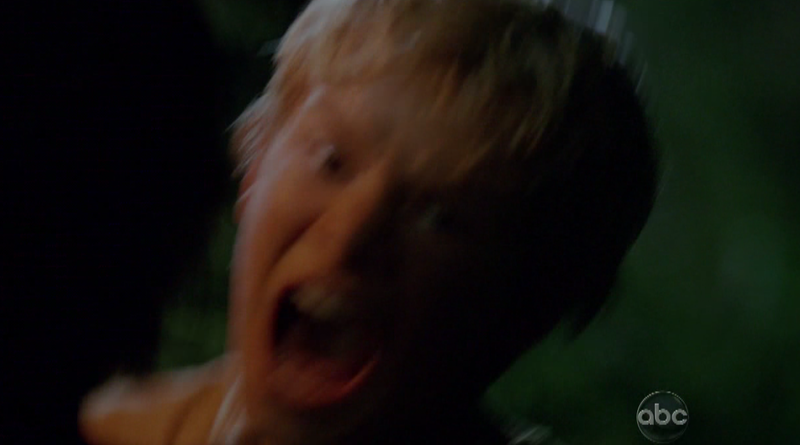 But it is interrupted by Claudia screaming again. Oh yes, there was a 2nd child! Another boy. Of course, we already know that this is the BOY IN BLACK (BIB). Claudia did not expect a 2nd child and states that she only picked one name. DOH!! I couldn't help but laugh here. We all think we're going to get the name but then she just doesn't have one for him. I mean come on people. That is funny stuff! Also funny was that she wrapped up Jacob in a white blanket and the BIB in a Black blanket. Good times! Anyway, did Fake Mom see this as her way out of her current predicament? 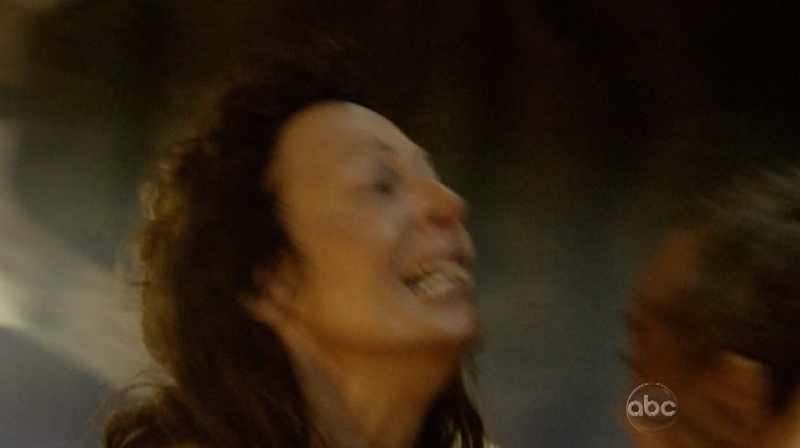 Was Claudia doomed to die regardless of her feelings towards BIB? Probably...but it sure seemed like it was the reason that she gravitated towards BIB over Jacob. We revisit Jacob and The Boy in Black years later into their early teenage years. 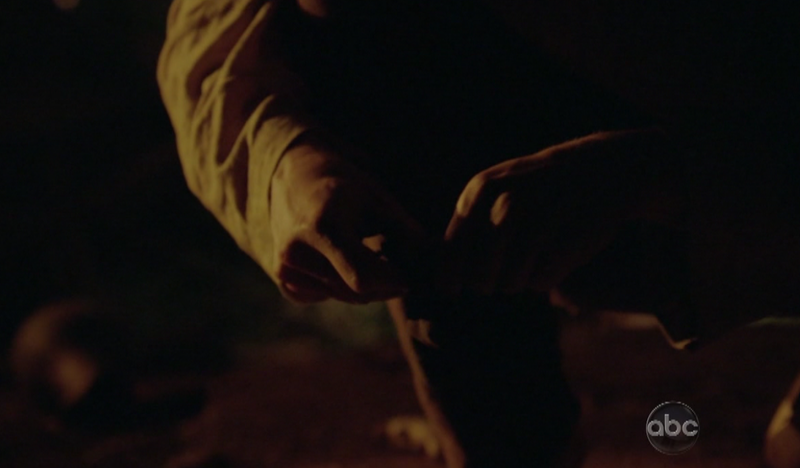 We confirm that Jacob is indeed the Ghost Boy we've been seeing on the Island in present day. The Boy in Black has found a game on the beach. 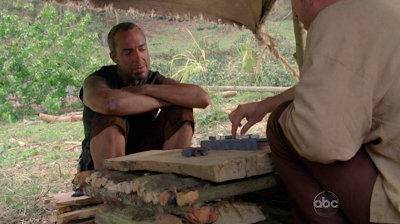 Jacob runs up and sits on a log with BIB to discuss. BIB explains that he just knows how to play the game and he will teach Jacob how to play as long as he doesn't tell their mother. 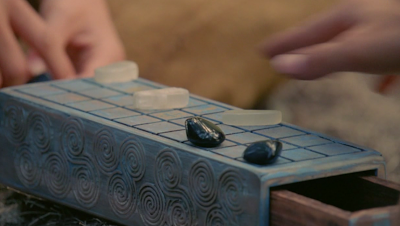 The game looks very much like the Egyptian Game of Senet, something that many of this blog's commenters have brought up on various occasions (as recently as last week!) 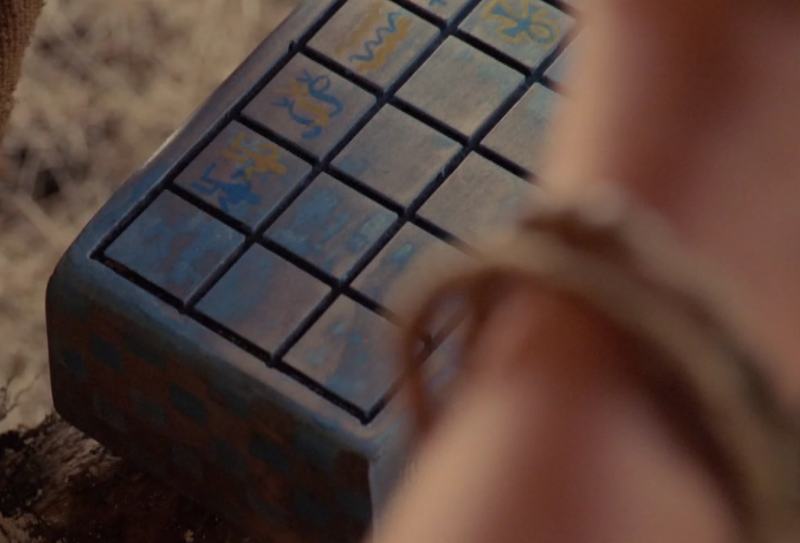 We know that there are various ties to Egyptian lore on this show, and it's looking like we may never really get to see WHEN or WHY that started. (or how the statue got built...but alas, we go back to the Big Bang Questioning again. We know the Island is old and we know many people were brought there over the years. Maybe that's enough) Anyway, here's more Egyptian stuff! Jacob promises to keep quiet and wants to play the game. 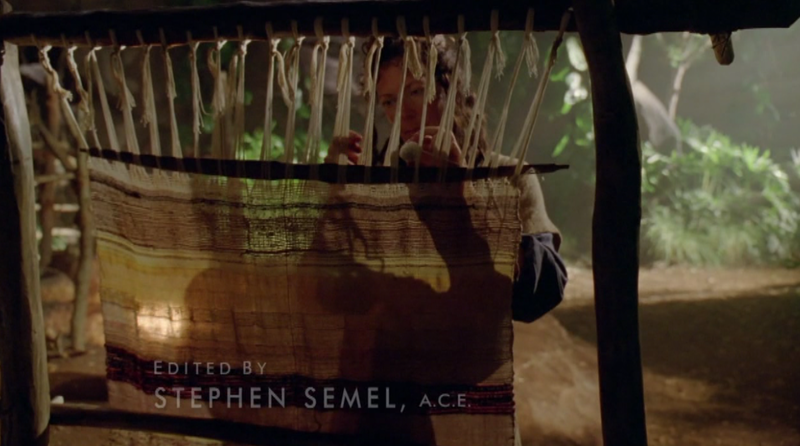 We see stand-in Mom creating a tapestry. 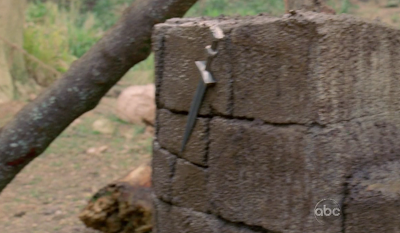 Hmmmm, well now we know how Jacob learned the skill of making one. But, we may even learn WHY he was making one by the end of the episode. Fake Mommy Dearest asks Jacob where his brother is, to which she already knows Jacob is keeping something. He tells her that BIB is at the beach staring out at the ocean. Already, early hints that this boy wanted to get off of that rock! And of course, we can't forget that Jacob told Hurley that Jack needed to stare out at the ocean to figure out for himself what he needed to do next. Doesn't seem to fit with BIB staring out at the ocean, but I thought it was worth bringing up. 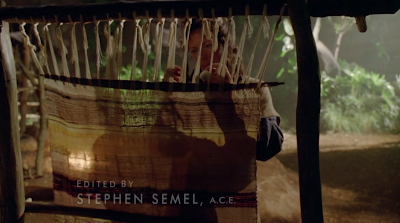 Jacob offers up his help with the tapestry. Yep, he's learning! Mother Other asks what they were doing down at the beach. Jacob wasn't very good in his lie. She asks him if he loves her to which he responds yes. (interesting question, right?) She demands the truth. Faux Mom tells BIB that he is special, which it would seem she was grooming HIM to be her replacement. He asked if he could keep the game which she said that he could as she left it for him in the first place. BIB was hoping that it came from somewhere other than that Island...somewhere Across the Sea. She goes into LONG CON mode to try and convince him that there is nowhere off of that Island. The Island is it. Why would they know any different since they were born there and knew nothing else in life? The questions start coming from BIB - Where did we come from? She says that they came from her, she came from her mother....to which BIB asks where her mother is. She tells him her mother is dead. And of course, BIB has no idea what DEAD even means. Fake Mom tells him that Dead is something he will never have to worry about. We next fine Jacob and MIB running after a boar with their hunting sticks. But before they can catch up with it, someone else drives a steak into the boar instead. 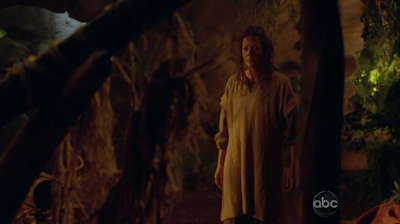 They have never seen other people like the on the Island, so they immediately go to their "mother". She says that these people are not like them and do not belong there. And then she explains that they are there for a reason. 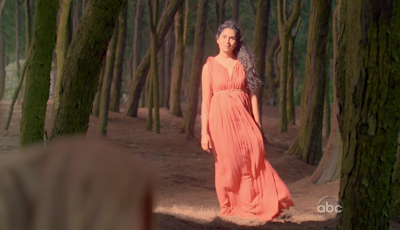 She is about to tell them but then hesitates thinking that it is not time yet. 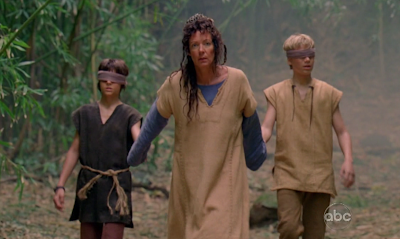 She brings them blindfolded through the jungle, to which we learn is so that they cannot find their way back there. She tells them on the way that she knew about the people and that they are dangerous. She then says that what makes them dangerous is the same thing that makes ALL MEN dangerous. "They come, they fight, they destroy, they corrupt...it always ends the same." 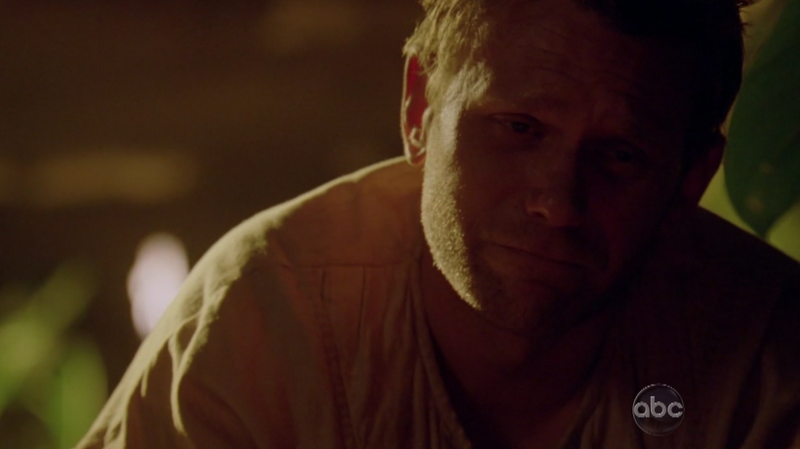 Some may recall the Man in Black telling Jacob this the first time we met them during the Season 5 Finale. She then lies telling BIB that they come from another part of the Island and that he should not go looking for them. She says that they will hurt them because they are people and that is what people do. BIB then asks if they can hurt each other since they are people too. She removes their blindfolds and tells them as she touches them (in a future Jacob-like sorta way) "I've made it so you could never hurt each other".......interesting.....Perhaps when you are the PROTECTOR OF THE ISLAND, you can make up your own rules? Was this the reason that MIB couldn't kill Jacob himself? And why he needed to find a loophole? Or is she some crazy kind of deity that just has these super powers? I am more inclined to believe that these "powers" are passed from one protector to the next. 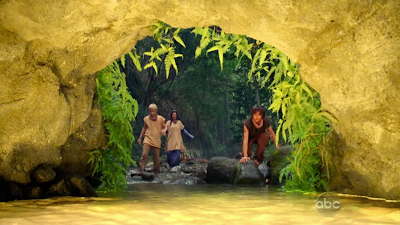 Then she turns them around and she shows them some a BRIGHT GOLD LIGHT going into some kind of cave. "This is the reason we're here." Seems pretty important, right!? She warns them to not go in there. What's down there? LIGHT. (nooooo really?) The warmest, brightest light they have ever seen or felt. And their reason for being there is to make sure that no one will ever find it. BIB exclaims how beautiful it is. The Mother explains how a little bit of this light is inside of every man, but they always want more. Jacob asks if they can take the light. She tells them that they can't but if they try it may put it out. And if the light goes out, it goes out everywhere......ummmmm APOCALYPSE anyone? All because of a little Nightlight? I'll admit, I was a little underwhelmed at this "protect the light" concept at first...but then they started adding to it during the episode, and I found it a little more interesting. A fellow commenter on the blog (AUStarWars, who requested I give him credit if I used this reference) made note to talk about the almighty mysteriously glowing BRIEFCASE in Pulp Fiction. We never truly learn what is in that briefcase but the fact that we don't know what is in there is what drives so much debate. LIGHT inside Man? Yeah...we may need to wait until conversation #2 with this woman to discuss this Glowing Light further. But at this point we all were pretty much saying...."REALLY??" She told them that she has protected this place but that she won't be here forever. Then looks at the both and tells them that it will have to be one of them. We leave this scene with the Fake Mom looking at BIB and him staring with excitement over the cave. We return to the game of senet that Jacob and BIB are playing. Of course, BIB seems to be making up his own rules to the game. And after BIB has had is fun rubbing in his rules to Jacob, he then sees the GHOST of Claudia (his true mother) roaming around. Granted, he has no idea who she is. And also interesting to note....Jacob cannot see her! BIB excuses himself and moves towards the ghost. He asks why Jacob cannot see her. She says that it's because she's dead. Ummm, Okay, so then why can HE see her? 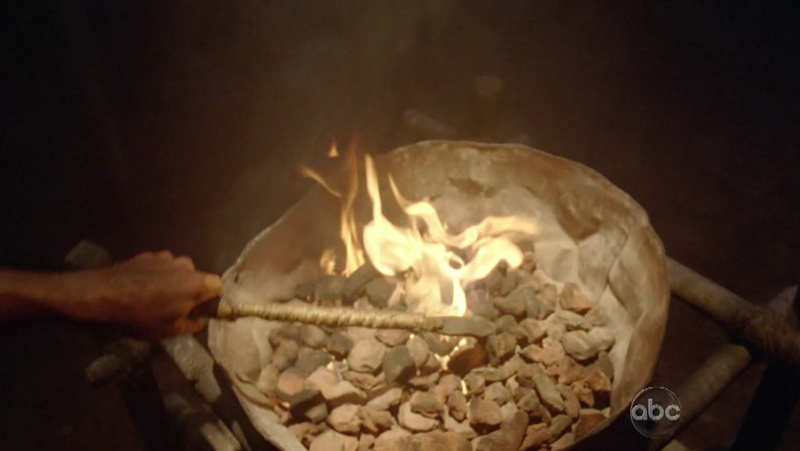 And don't even tell me this is foreshadowing that Hurley is going to become the next smoke monster! Of course, we know Desmond and Sawyer both saw Ghostly Visions of Kid Jacob as well. So what does THAT mean? 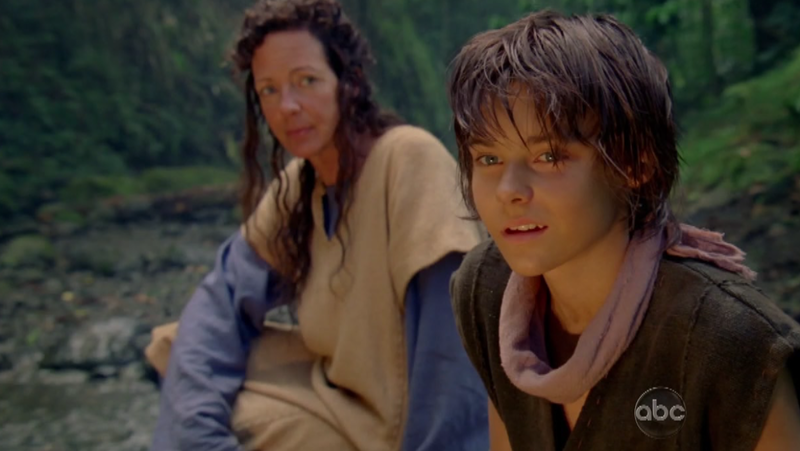 Claudia asks the Boy in Black to come with her so that she can show him where he comes from. 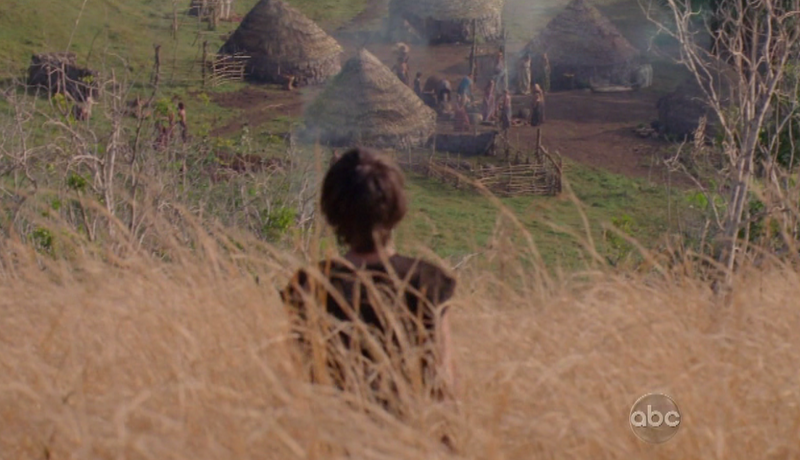 He follows her across the Island to a camp with huts and lots of people. Who are they? Well they are the other people that were on Claudia's ship. We are told that they came 13 years ago and that their ship was wrecked in a storm (hmmm, another storm. We know something is coming on this! I figured it would be in this episode. Not so much!) She explains to him what a ship is since he never heard of one. It is how they came across the sea. She explains that there are many things across the sea. Naturally, this is the start of his interest being very high of getting off of the Island. 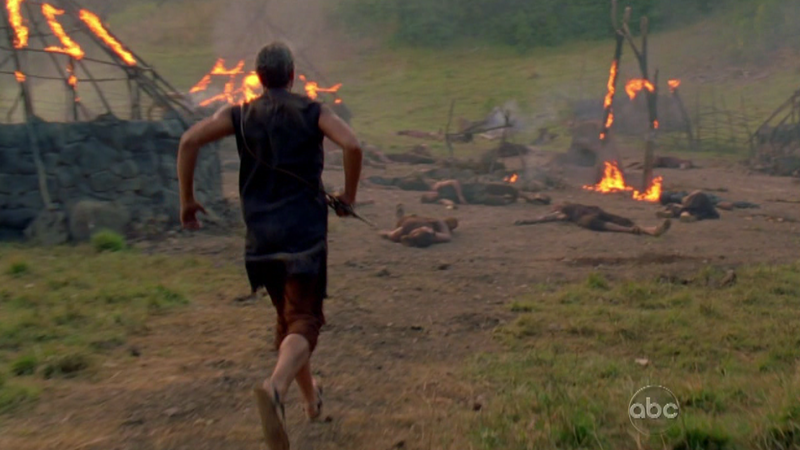 Of course, now it makes more sense of him wanting to get off of the Island to "go home". It doesn't necessarily mean that he wanted to go back to be with his family or anything like that. He just knows that he wasn't supposed to be born on that Island and he wants to see what is OFF of the Island. 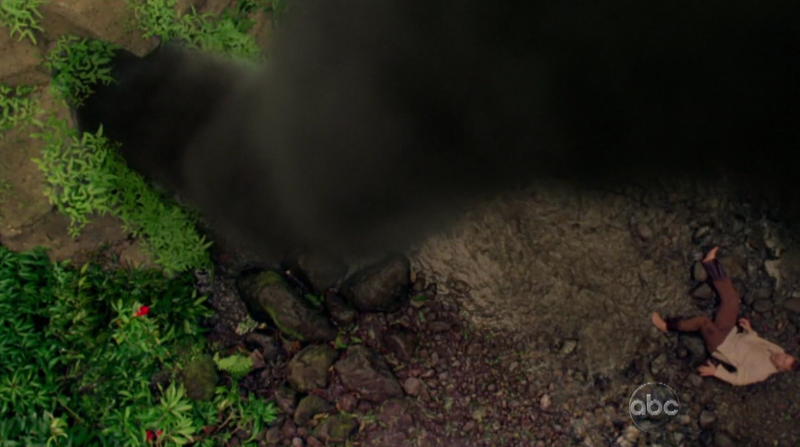 Of course, this is assuming that this Boy is still whatever is driving the consciousness of the Smoke Monster. But we'll get to that below. Claudia breaks it to BIB that she is his mother not that other lady. He didn't look to thrilled to learn that! 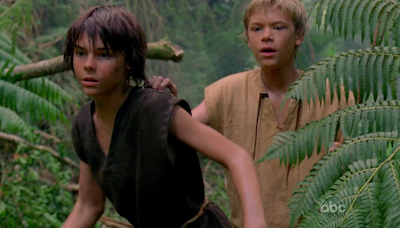 Boy in Black goes back to the cave to grab some stuff and Jacob and then he takes him out into the jungle. He tries to reason with Jacob and tell him that they are never going back and that their "mother" lied to them all of this time. That their real people were the people on the other side of the Island. Jacob just refused to believe it and ended up beating BIB to a bloody pulp. Woaaaa easy there Jacob! And what is up with the "HURTING"? Didn't we just learn that she made it so they couldn't hurt each other? Perhaps it was just not able to KILL each other? Or maybe she never did anything and it was a rule that JACOB put into action? Or maybe I'm looking too much into this? In either case, Jacob has a bit of a mean edge to him as well! But we had seen that in Ab Aeterno also. Fake Mom breaks up the fight and is horrified at what Jacob has done to his brother. He explains that BIB is planning on leaving to go to THEM. BIB explains that he knows now what happened. He knows he is from across the sea, that she murdered their mother. He then pleads with Jacob to come with him as neither of them belong with her. Jacob refuses to go with. 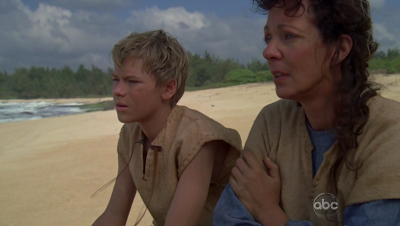 Then the "mother" pleads with BIB and tells him that he will NEVER be able to leave this island. She looks dead serious too. He refuses to believe her and says he will prove it one day. And then he left. The next day is a pretty defining day into the future destiny of Jacob. Jacob learns that BIB will not return and also his fake mother admits to killing his real mother. She says that if she had let his mother live, she would have taken Jacob back to her people who are bad people. She couldn't let him become one of them. He needed to stay good. So what do we think? Is this what inspires Jacob to start making lists and kidnapping children when the 815ers crash on the Island? Did he have anything to do with that or was that Ben calling the shots? It would seem that he wants to prove to MIB in the future that people are inherently good and that he shouldn't have to interfere to prove this. So, I give the question about "why did the OTHERS take the children" an ALMOST answer! But there is still plenty of room for debate. 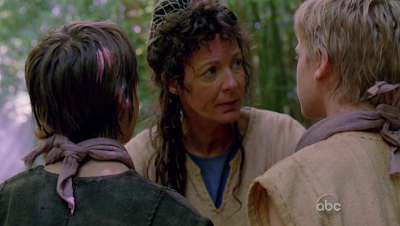 Jacob then questions whether he is good or not and asks why this woman loves the Boy in Black more than him. Her response is that she loves them in different ways. Um...interesting! Not sure if this ever sits well with Jacob considering his reaction 30 years from then. But in any case, this woman asks Jacob to stay with him and he does accept that he will stay "for awhile". 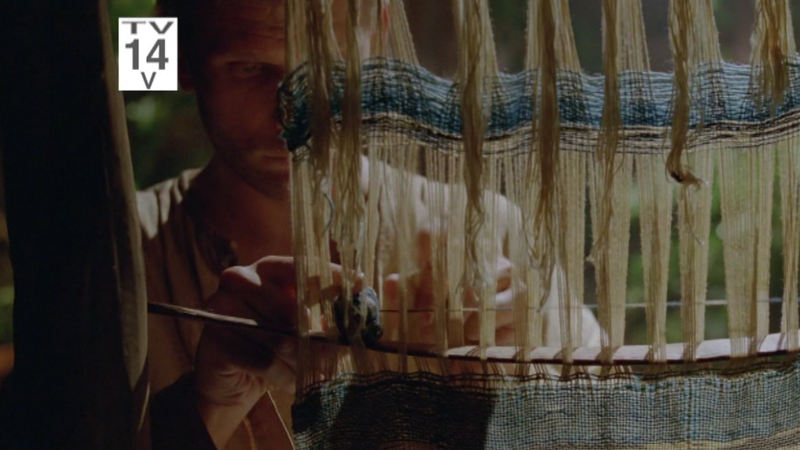 We catch up with Jacob who is now working on that tapestry by himself. It is most likely the same one that they were working on 30 years prior. As we recall, Jacob spoke to MIB and Ben of how long it takes to make one and to actually make the thread. "But I guess that's the point." The tapestry looks near completion and Jacob asks what his fake mother thinks about the end result. She looks less than thrilled but tells him it is very nice. When Jacob asks if she is okay, she responds that she is just tired. We catch Jacob watching the shipwrecked crew who have all been there for 30 years now. 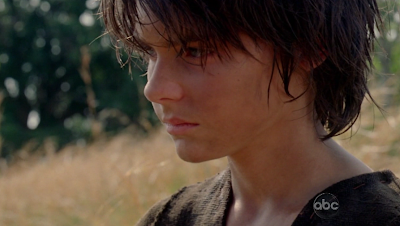 And of course, he has been watching his brother, the now fully grown Man in Black, as well. It looks like Jacob and MIB have been meeting behind their fake mother's back for years now. And they continue to play their game of senet. MIB regrets asking about the woman as she never asks about him. We should note that Jacob acts very childish in this scene, but considering he has had no human interaction besides his "mother" and sometimes his brother, maybe that's to be expected? Anyway, MIB asks why Jacob watches them. And Jacob says that he wants to know if their "mother" is right about MIB's people and if they're bad. The man in black admits that the woman is insane ("I too had a crazy mother") but that she's definitely right about the people being "bad people". Jacob doesn't really see it. He said it's easy for Jacob to judge from above, but he has lived among them for 30 years. They are greedy, manipulative, untrustworthy, and selfish. He is only with them as a means to an end. This is most certainly the beginning of their conflict that we see repeated in Ab Aeterno with Richard and the opening scenes of season 5's The Incident. Jacob trying to prove that man is inherently good and MIB proving that all men are corruptible. MIB wants to leave the Island and tells Jacob he has found a way off. Jacob said that it's impossible and that there is no way off of the Island. Then out of nowhere, MIB takes his infamous knife and throws it at the well behind him, and what do you know? IT STICKS to the side! oooooooh magnetism! Although, they have no idea what to call it since they have lived on this Island their whole loves and who knows how much the outside world knew of Magnetism/Electromagnetism in whatever year it is? I'm sure someone on wikipedia knows! It is interesting that this wiki entry dates awareness of magnetism back to 625 B.C. however the discovery of Electricity and Magnetism causing compass needles to spin is around 1819. 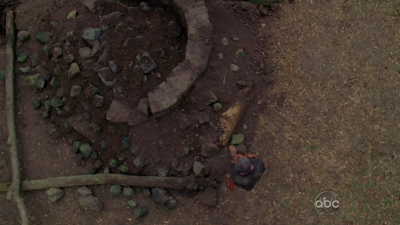 And we all remember Flocke explaining to Desmond how people wanted to see why their compass needles were spinning when they walked to certain points of this Island and so they started to dig, right? Anyway, I've imagined Jacob and MIB's conflict having gone on for much longer than the early 1800s but it is interesting nevertheless! MIB asks Jacob to come with him, asking what he's going to do when their fake mother dies. Jacob states that she's never going to die. MIB, in perhaps a foreshadowing comment, states that "everything dies". Jacob states that he doesn't want to leave this place as it is his home. MIB retorts that it isn't his. He will stop at nothing to leave the Island. Jacob returns to the cave and his "mother" asks him where he was. Jacob assumes that she knows where he was. So, as we learned, Jacob is no good at lying. It would seem she knew he has been meeting with MIB all along. 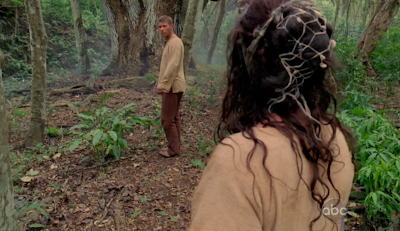 Jacob tells her that the Man in Black has finally found a way to leave the island. She seems very concerned about this. 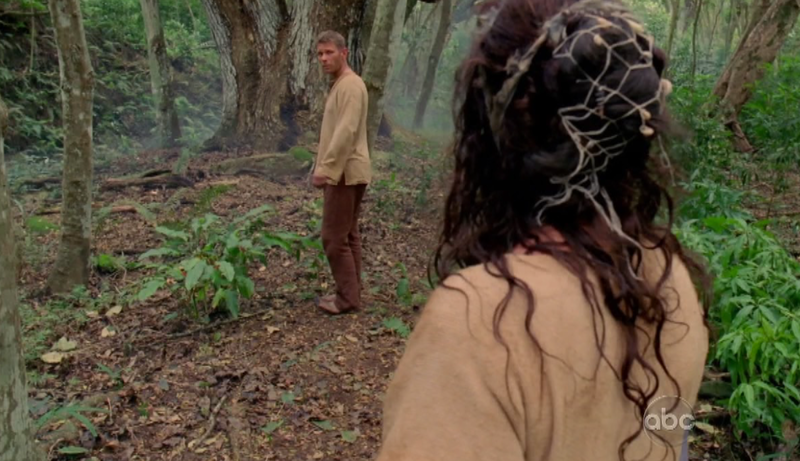 She heads out into the jungle to confront her former favorite fake son herself. She heads to the well and waits for everyone to walk away from it. Then, she heads down the ladder. MIB is there playing with the fire. I looked for some symbolism with the hot coals and the fact that he kept prodding at it, but I got nothing! Foreshadowing of his smokey fate? Maybe...but let's move on! Fake Mama is there! He turns to face a potential attacker but then sees that it's her and he permits her to join him. She is worried and MIB states that she should be. He has been searching for that cave of beautiful light for 30 years. He has become obsessed with it, but not once has been able to find it. But then he began to think what if he could get to the light underneath the Island from some other place? The people he is with have seen this too and have some very interesting ideas on what to do with it. He shows his angst towards his "mother" in stating that she wouldn't tell him what they were dealing with. 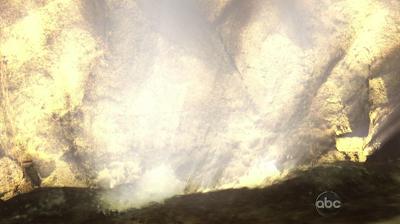 He then starts prying away at the rocks in the cave, and sure enough, there is that bright light! And what else? 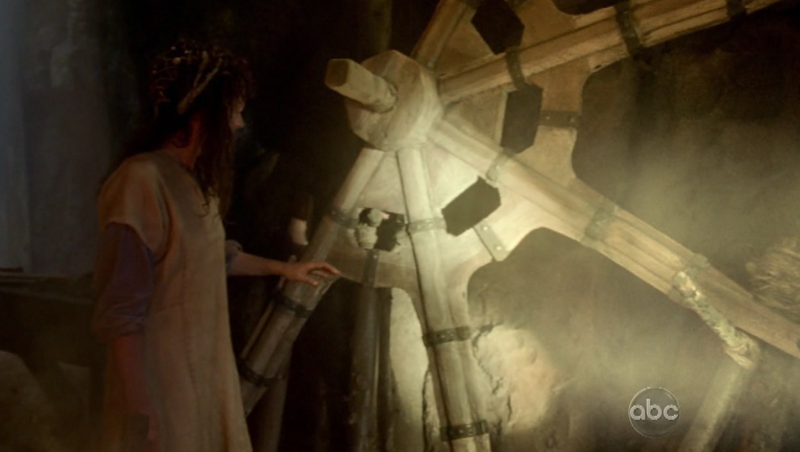 Yep, there is a large wheel standing upright in the cave. The pieces start coming together. It's the Donkey wheel that was located underneath the Orchid station! The one that moves the Island through time and space and the one that shoots people off of the Island into Tunisia. WOA!!! Totally never expected them to answer where that wheel came from! MIB says they're going to make an opening and then he will attach the wheel to a system they're building that channels the water and the light. And then he's going to turn the wheel, and when he does, he will finally be able to leave this place. Very interesting. First of all, I'm not going to comment on whatever year it is and that these people would be smart enough to know how to build a system so advanced that they could generate some kind of wormhole that would transport people off of the Island. But, I do like the fact that they addressed it. The wheel has been part of MIB's fascination all along. Smokey advised Locke to move the Island which sent Ben and eventually him off of the rock and working into his eventual loophole to killing Jacob and getting to the point he is at now. It's been his since the beginning. 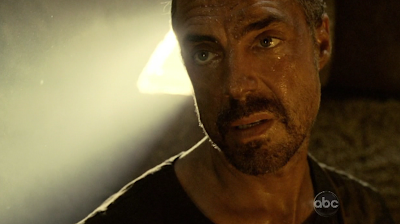 So, when we see Christian Shephard in that cave helping Locke in season 5, we now know that was not the Man in Black's first time down in that cave, and in fact he has a lot more history in it than we knew. I still question why the wheel was frozen when Ben went there. And I still suggest that it has something to do with Desmond blowing the hatch at the end of season 2 and stopping the moving island in its tracks (and allowing Charles Widmore and Penny Widmore to locate the Island and get to it). But that is a theory, I'm afraid, that I'll be carrying with me after this show is over! Unless it somehow plays into the end game of the show. Like I said though, I'm pretty excited that the Donkey Wheel made its way back into the story and that they felt this was an essential answer to provide! Of course, we never see this wheel completed prior to the extermination of these scientifically advanced folk on the Island. So, I do question how it WAS completed! But I'm getting ahead of myself. "Mother" stresses that he should not go. But MIB keeps claiming that he is special and that he does not belong here. It keeps stressing how badly he wants to leave this Island. So his fake "mother " then seemingly gives up and tells him goodbye. They embrace but then just as she had said to his real mother, she apologizes and then runs MIB into the wall knocking him unconscious. I thought for sure that she killed him, but not so much! She had other plans instead. We next join the woman with Jacob walking back to the place he took him and his brother when they were children. 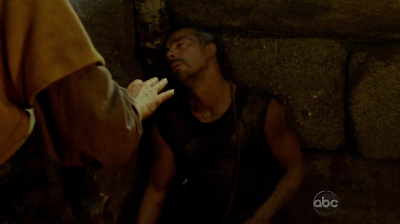 She wakes him up in the cave and tells him "It's time." On the way she tells Jacob that she had to say goodbye to his brother. She doesn't have a choice but to let him go, it's what he wants. Hmmm, really? Is she lying to Jacob here too? 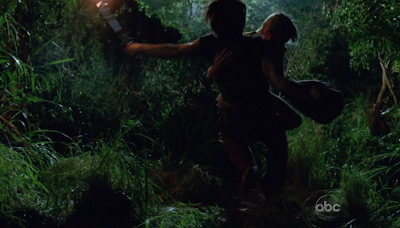 Because she most certainly did not let him go! She brings him to the LIGHT Cave and then tells Jacob that he is going to protect it now. This is not a task that Jacob accepts very willingly. But we'll get to that in a second. Jacob asks what is down there and the woman gets a little more descriptive. 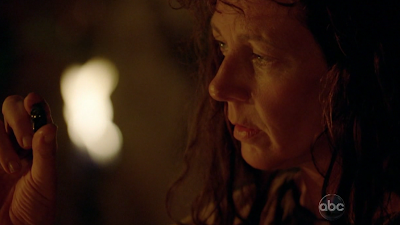 She describes what is in the cave as "LIFE, DEATH, REBIRTH - It's the Source, the heart of the island." She asks him to promise her that whatever he does, he will not EVER go down there. 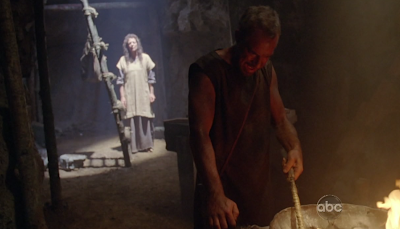 Jacob asks if he would die, to which she responds it would be worse than dying, much worse. Now, I think we know what that 2nd half of the discussion means by the end of this episode. But as for what is in the cave, Life, Death, Rebirth - the heart of the Island. Can we assume that this is why there are dead spirits roaming around the Island? Sure, not sure it would explain why they are OFF of the Island too (following Hurley around). But when she makes a comment that if the light goes out there, it goes out everywhere..that sure sounds like it's talking about the rest of the world. What about this REBIRTH comment? Could that possibly explain how Sayid was brought back? 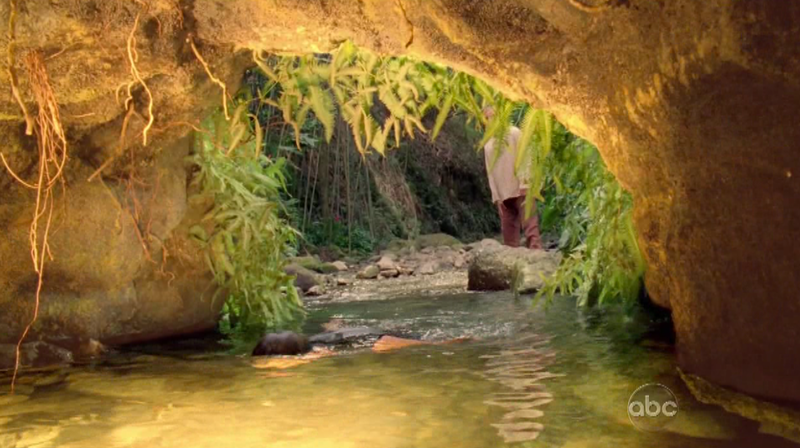 Could this energy have been flowing in the Temple Spring? (of course, tainted somehow by the Man in Black) Or does the Rebirth solely have to do with what happens to the MIB? Just throwing the questions out there. I know there are no answers! Something tells me they may leave it this vague and just allow us to speculate on it forever. One thing is for sure, this LIGHT that we are seeing, seems to be the same light that caused the Time Travel Flashes. 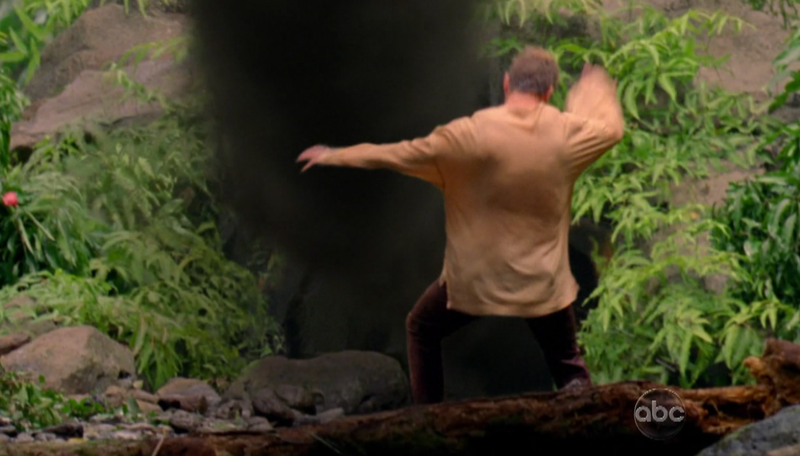 Maybe not the PURPLE SKY when Dez blew the hatch though (only because the producers have stated before that the light that surrounded the Island when it moved was different than the Purple light that surrounded the Island when Dez turned that key). 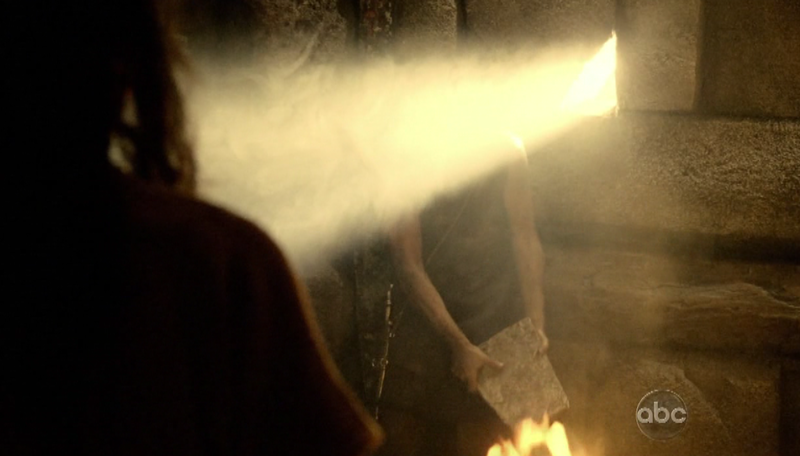 This LIGHT must be the "POCKET OF ENERGY" that the "healer" referred to in the Season 2 Rose and Bernard centric - S.O.S. episode and the same pocket of energy that Eloise Hawking referred to in Season 5's 316. It is what creates the unique properties of the Island and apparently it is very important to protect it for the sake of the entire world. That's what we get folks! If anything, it raises the stakes of the end game of LOST. Whether people like it or not is another matter all together. I am fine with it. I think more people will latch on when we see the characters we have become familiar with over 6 seasons dealing with what was set up in this episode. 3.5 hours left folks. 3.5 hours! It's coming whether we like it or not! Anyway, the mother pulls out the infamous bottle of wine that we first say in the Ab Aeterno episode. She pours Jacob a drink. She says something in Latin here as she consecrates the wine (yes, I used that word intentionally). Anyone that is versed in Latin can feel free to chime in on what she said! I'm sure it will be up on Lostpedia before we know it! She passes the cup to Jacob asking him to drink it. 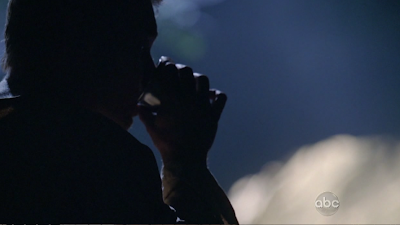 By drinking it he accepts the responsibility to protect this place for as long as he can, and then he'll have to find his replacement. So, she pretty much admits to killing Claudia and raising these kids to eventually replace her. Did she BRING this ship to the Island? Did she cause the storm that wrecked the ship? Similar to possibly Jacob causing a storm that brought the Black Rock there? 3.5 hours folks, 3.5 hours! But, what we are treated to is finding out how reluctant Jacob was to accepting this responsibility. She mentions that her time is over and that he must do it. Interesting in that she pretty much knew when her death was coming, similar to Jacob knowing that his was coming. Jacob felt that she was only asking him as a last resort because she had favored the Man in Black. She tells him that it was always supposed to be him and she sees that now. She mentions that one day Jacob will see it too, but in the meantime, he doesn't really have a choice. I know I'm getting sidetracked but I have to ask while I'm thinking about it. So, when does Jacob learn how to leave the Island? As far as he is concerned, there is no way off of the Island. When you become the CHOSEN one, do you just eventually "SEE IT" as the woman mentions above? We know he does leave the Island MANY times. And did SHE ever leave the Island to scope out her replacements? Every question answered leads to more questions! Anyway, Jacob does reluctantly take the cup of wine and takes a drink from it. The woman then tells him that he is now like her. So did drinking from the cup make Jacob immortal and give him the crazy healing powers and all of that fun stuff? Or did drinking from the cup just make him immortal? 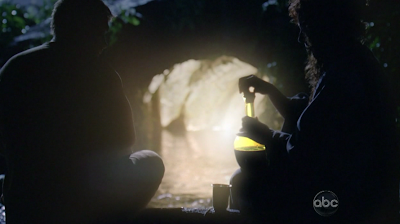 Does drinking the wine signify you are the next person to protect the Island? I ask because the first thing I thought of was Jacob offering RICHARD the wine. Maybe it wasn't Jacob's touch that made him immortal but it was drinking this wine. 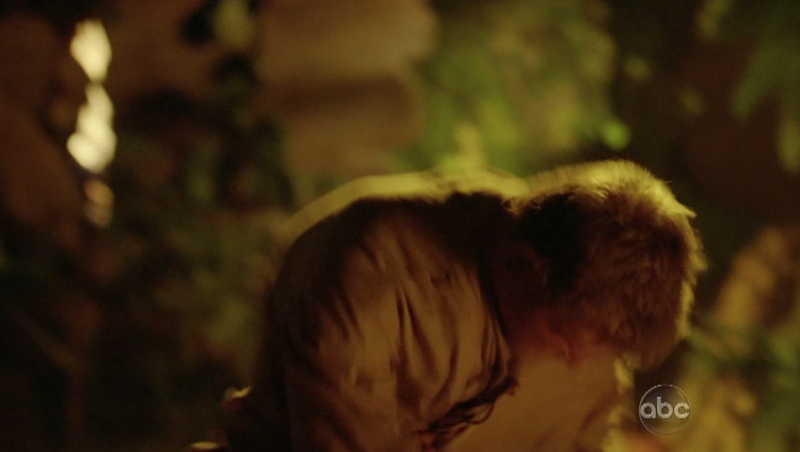 And if that's the case, MIB smashed the bottle of wine, so what would be the ritual for the next protector of the Island? And is the fact that Richard is immortal signifying that he was always next in line to replace Jacob all of this time? It would sure seem like a huge waste of a season to protect these candidates if that was the case, right? Anyway, interesting questions regardless, but this scene signified the start of Jacob's reign as ISLAND PROTECTOR. And it was very interesting and very fitting to see that he didn't want the job. MIB wakes up from his unconscious spell and sees that there was a path of destruction that occurred during his slumber. The well is completely filled. This is very interesting considering the fact that at some point in time (early in time), John Locke lowered himself into that well where there was a completed donkey wheel lodged into the wall of this pocket of energy. Later on we see Sawyer try to jump in and the well is filled but that was in 1974. So did MIB dig it back up again? Again, I think it will be left to speculation. The filled in well certainly didn't look as destroyed as this one either. Maybe that well was NOT the eventual "Orchid Well" where the wheel was placed. But it would seem like that is what they were trying to show us in this episode. Oh well, I won't harp on it much longer! MIB is clearly not happy with what has gone down here. He finds his little game that his "mother" gave him so many years ago and has a bit of a breakdown. And this breakdown quickly turns to anger. Jacob and his "mother" are walking in the jungle back from the LIGHT CAVE and they hear a roar of thunder. Jacob notes that a storm is coming to which she agrees. She knows her time is up and she sends him off to get some firewood. Is there a significance to the STORM arriving before this significant moment in Island history? Maybe. 3.5 hours folks! His "mother" gives him some parting words that meant more than just getting firewood. "Be Careful." Back at the cave, the woman arrives and not long after she sees that there have been some changes since her last time there. The tapestry was destroyed! (perhaps motivation for Jacob to make a new one that took him over 140 years?) And of course, by the time he was finished it was time for him to die. How ironic! Then she notices something in the cave that has not been there for 30 years. 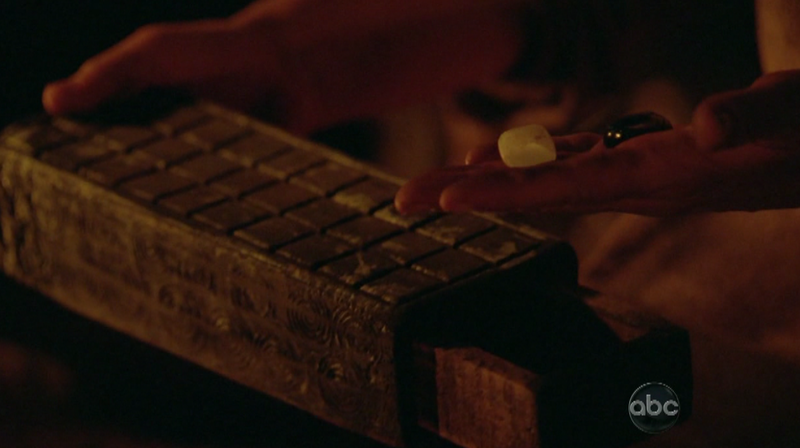 Yes, the Man in Black's Senet game. The circle is complete. 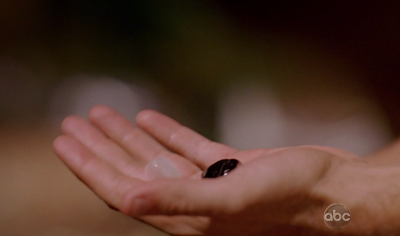 She pulls out a white and black stone from the game and holds up the black stone to her face. Before she even has a chance to utter one word, a knife is stabbed through her back and through her heart in the cave where Jack, Kate, Locke and crew found 2 dead bodies all of those years later. 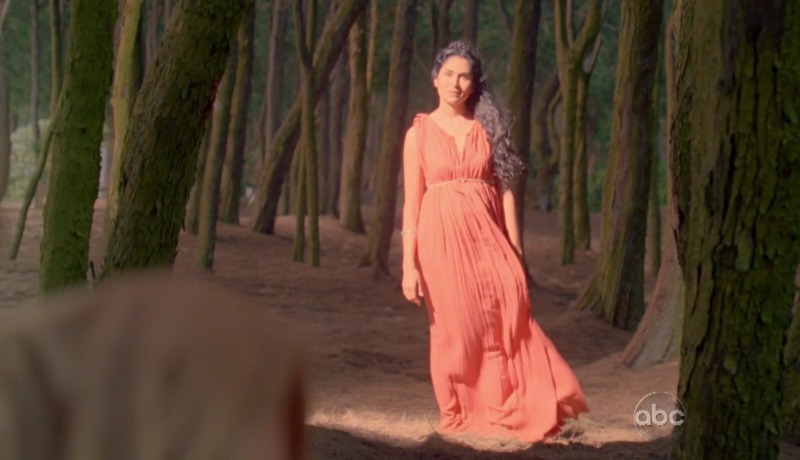 Immediately, we recognize that this woman is indeed EVE! Yes, it may not be her real name, but it'll be so much easier to call her that. And at this point, I pretty much knew that my prediction on Adam was about to come true! 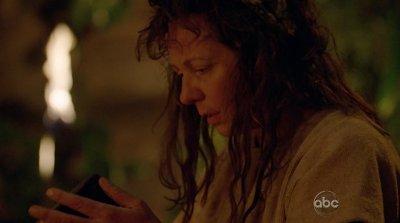 RIP EVE, you were one crazy but significant lady in your brief stint on LOST! 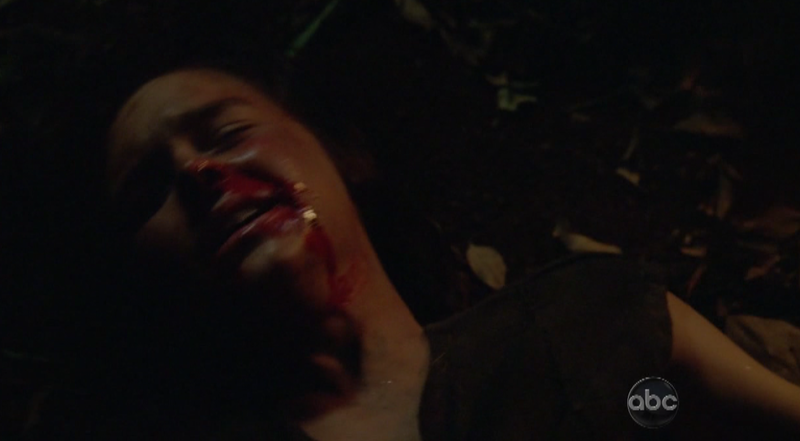 Do we think that there is significance in the fact that she never spoke before being stabbed? We know Jacob did speak before Ben killed him. But they made such a big deal about using this knife and attempting to kill either Jacob or the Man in Black by stabbing them before they could speak. In both cases, they spoke and it was too late. I believe it was just due to their persuasive abilities and not the fact that it would prevent them from dying. But, I still found it ironic that she didn't talk. 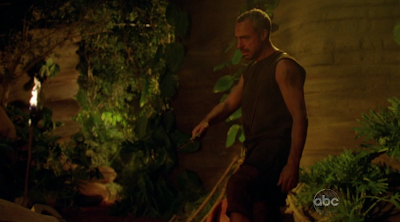 Jacob arrives to the caves and witnesses the tragedy before him. He isn't not too thrilled with his brother! 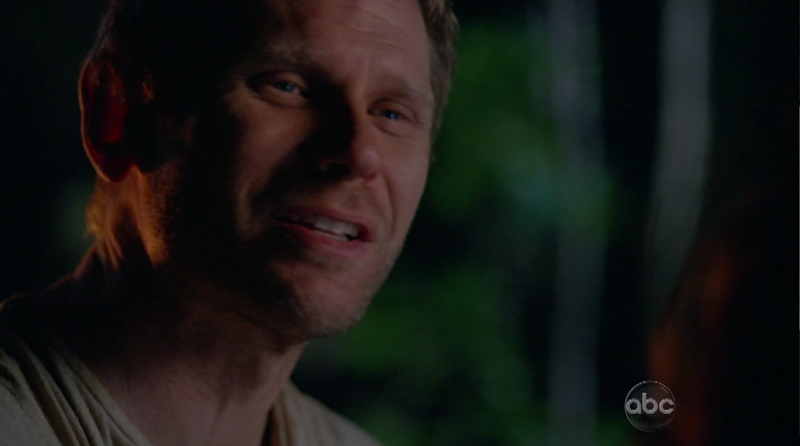 The Man in Black, in tears, begs Jacob to listen to him. But Jacob is furious. He dives into him and begins to beat him just like he did 30 years prior. Jacob then drags him all the way to the LIGHT CAVE as MIB pleads along the way. He says that their "mother" was crazy and that she burned them all. 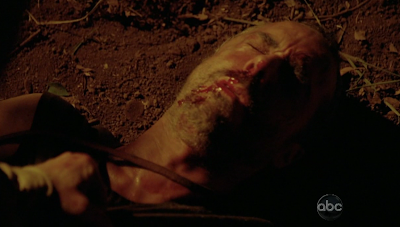 He said that Jacob can't kill him. "She made it that way." I guess that answers the question. They could beat each other up as much as they desire but he can not kill him. Jacob told his brother not to worry as he is not going to kill him. There just so happens to be a place on this Island he can take MIB where he can provide a punishment much worse than death! They arrive at the cave of beautiful light. MIB is upset that she brought Jacob back here and wants to know why. He tells him that he has to protect it now. He then asks his brother if he wants to leave this place. He then throws him into the water flowing towards the cave and tells him to go. OH BOY!! He goes in and drops down into the light. And I think we all expected what was going to come out! The light in the cave seems to darken, and a familiar sound starts to come out of it. And alas, the evil trapped within this cave of energy seems to have been released in the form of a column of black smoke! The Man in Black has been stripped from his body and is now trapped in this smokey form (at least, that is one way to look at it). 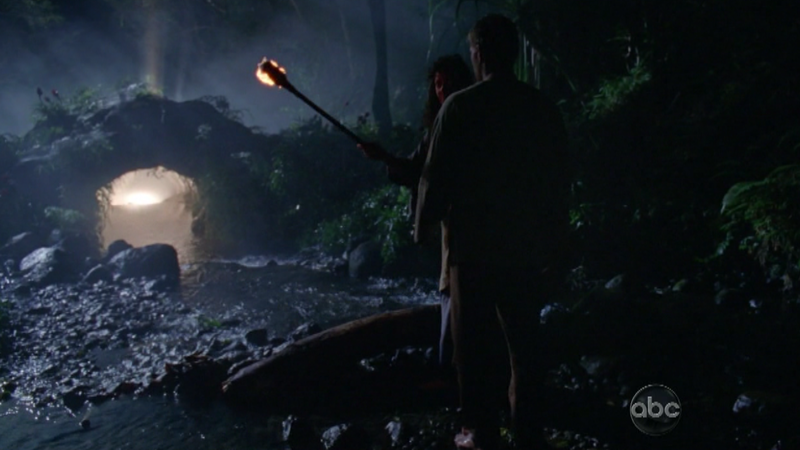 So, I guess Smokey was never meant to be a security system for the temple or the Island. It's just what the French people consumed with the darkness assumed it was? 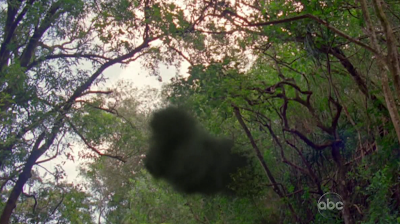 I guess that Jacob DID in fact create the smoke monster as I, among others, had speculated before. But I never would have expected that he UNLEASHED some kind of evil on the Island in a revenge scheme! Pretty fun turn of events if you ask me. I still wonder how long ago this was though. Because we did see engravings in the Smokey Cave in season 5 with the Smoke Monster on it. Of course, even if this is AFTER the Egyptian times on the Island, maybe this Smoke was released once before on the Island but then put at bay. I dunno, we can speculate forever, but we already have our BIG BANG Issue that the producers brought up. We'll always ask what happened before. Opportunity for some LOST Prequels I guess! But, considering what happened to Star Wars, maybe we should not consider this! Maybe the official LOST Encyclopedia will have a timeline of events to help clarify when everything took place. And perhaps share a little more history that wasn't included in the show. Jacob runs further downstream, washes his face and then discovers the lifeless body of his brother. We are reminded by what MIB told Richard in Ab Aeterno "He took my body". We could speculate that MIB actually died and that Smokey is really a collaboration of ALL Evil and all dead spirits on the Island. But, so much that has happened this season seems to have been motivated by the MAN in Black. Yes, it can take the form of dead bodies or apparently belongings of dead people on the Island but the consciousness or soul in charge seems to be the Man in Black, right? He is the one that wanted to find a loophole to get off of the Island. He is the one that wanted to GET OFF of the Island! He lost his body and is angry at Jacob for it. He had a crazy mother. He has experienced LOSS. Yeah, maybe the Smoke Monster (Evil Incarnate) has an agenda OFF Island and maybe MIB's motives are also being used as an ends to a means. But, now I'm just starting to sound a little bizarre. It's at least worth discussing, but I have to think that Smokey and MIB are still one of the same. We have just witnessed that he lost his bodily form. His SOUL or ENERGY has been captured into this smoke form. Thoughts anyone? We see that Jacob is torn up by this moment as well. The 2 people he cared for most (and the only 2 people he knew) are now gone. Of course, he will eventually realize that the Man in Black is still very present and he unleashed some trouble upon this Island and possibly the world. 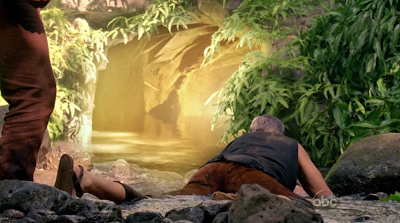 Jacob brings the Man in Black's body back to the cave and lays him down. He also lays the woman they have known as their mother next to him. 2 people that loved each other very much, just in a different way than we expected. He takes the black and white stones and puts them in a pouch and places them in the Man in Black's hands. 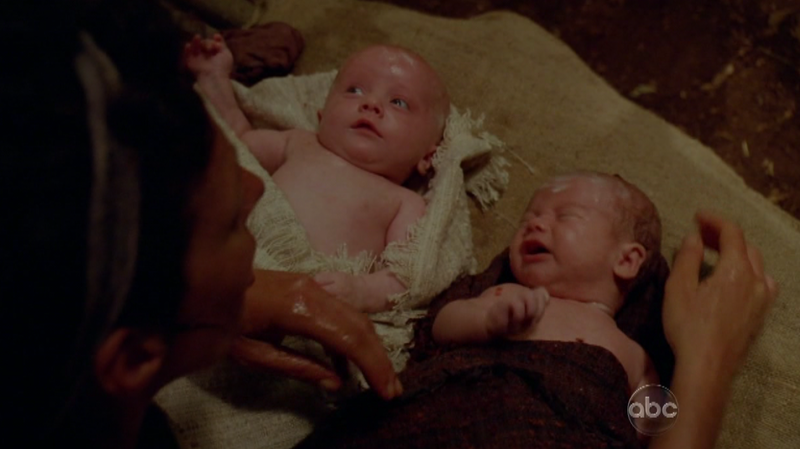 We see clips from Season 1 when Jack and Kate discover the bodies and Jack identifies the bodies as male and female. We see John Locke chime in saying "our very own Adam and Eve". What they seemed to have left out was the fact that Jack said the bodies (or their clothing) seemed to have decomposed over 40-50 years. Clearly, that fact is no longer in play. It can be justified by the fact that Jack is a spinal surgeon and not a forensics expert. And of course, the Island is a special place and things may decompose a bit differently. "Let me just take a wild guess here. Maybe ADAM is the Man in Black's body and his wife was Eve. Maybe Jacob had a hand in their death's? 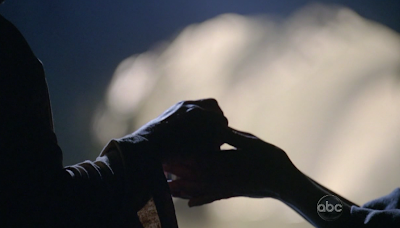 And maybe the Man in Black's eternal struggle for revenge has something to do with Jacob's hand in his wife's death. MIB talks about still feeling a sense of LOSS. Seems to tie in nicely, right? Oh please, hold down your applause, I'll be signing autographs after the show! Thank you thank you! " Like I said, I think we got 2 names in this episode. 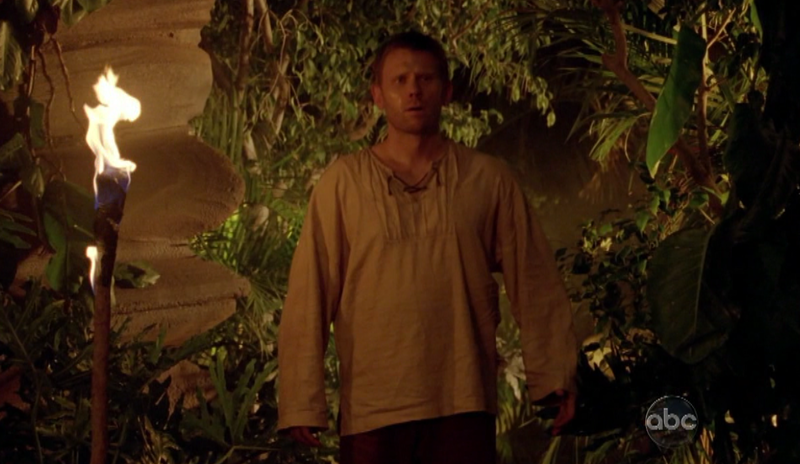 2 very important names in the saga of LOST. Adam and Eve. Maybe some people didn't care about this mystery or how they came to be. But there have been many also wondering for 6 years who they were and how they died just laying in a cave. 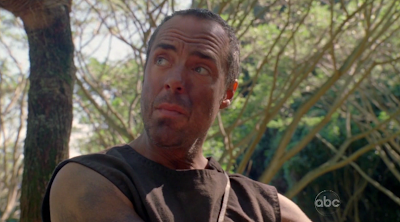 How crazy is it to know that Jacob, the Man in Black and the former protector of the Island used to live in the caves that Jack deemed worthy for the survivors to find shelter in? The same caves that the Man in Black (as Christian Shephard) led Jack to? And in the same episode learn the origins of the Frozen Donkey Wheel and know that the Man in Black was key to its creation? I'm sorry but I found this episode very important and I know there are haters, but I just refuse to agree with them! So, Damon Lindelof and Carlton Cuse have been telling us pretty much since season 2 that once we learn the identities of Adam and Eve we will know for sure they were not making it up as they went along. I have been speculating since before this season began that there is no way we could possibly think that with 100% confidence. That being said, they did a great job tying it all together. I think they may have had some idea where they were going with Smokey's character since season 1. That the monster was portraying Christian Shephard. That Smokey was formerly a man that lived ont he Island and his role will be KEY to the end game of LOST. I can believe that. For the actual details of the woman being his mother and the relationship between Jacob and Adam? I think that may have been a little more based on character developments since then. But tying in the Black and White themes from season 1, the end of season 5, and the stones throughout this season was a nice touch that was put to great use in this episode. I just thought it was a great job and a great history of the Island before our LOSTIES arrived to tell how the story "only ends once". And that ending begins next week folks. Are you ready for some EPIC storytelling? I sure am! The setup for the Series Finale starts next week. 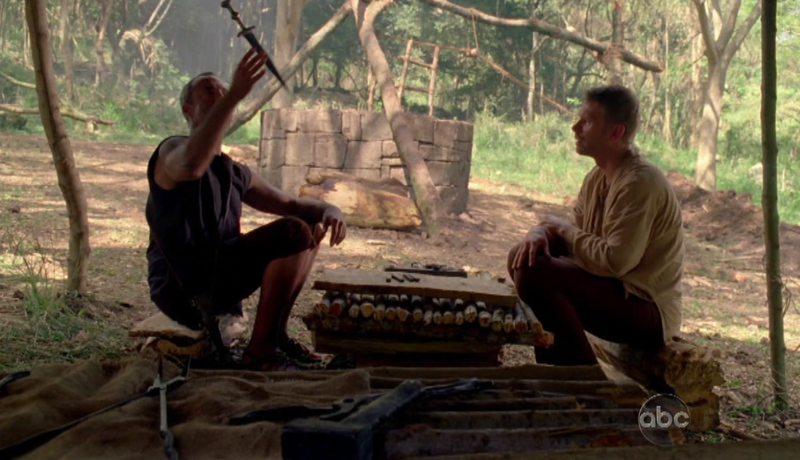 I cannot wait to continue the story of our LOSTIES, but we have plenty to discuss this week as well. Hope you enjoyed my ramblings as always and I'll see you next week for our final Tuesday episode. NAMASTE!! Thanks to Apple, my iMac and TiVo Transfer for the ability to capture the wonderful Screen Captures. And by default thanks to ABC too for allowing me to post pictures on the blog!